I believe his first one was Ardnave Point from the north, soon followed by Ardbeg Distillery on the south coast of Islay. The third and so far last panorama is of Port Askaig with a view over the Sound of Islay to the Paps of Jura. If panorama-photo.net sounds familiar to any of you, there's a reason for that: Almost exactly a year ago I mentioned Phil Gray's Islay Panoramas on exactly that site. 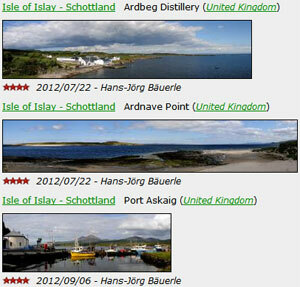 He has also added a few new panoramas since then, so you might want to revisit his ones as well.